I've been terrible at taking pictures of anything in the last few days. I've also been more terrible at answering text messages than usual (and I'm usually pretty terrible). Awesome. Starbucks' Mango Black Tea Lemonade. Not awesome. I got a terrible tan line from my canvas shoes. Don't mind the toes...I'm dealing with that this afternoon. Awesome. It's supposed to cool down this weekend. Not awesome. It's getting up near 100 degrees today and I'll be outside all day. Like, it says 94 but it's always hotter than what it says. Awesome. This bag from Old Navy. It feels and looks like it costs 5x as much as I paid for it. I got it for school after my friend bought it for a vacation and raved about it. Not awesome. I don't know what to do about Facebook. I scroll it, but I don't use it. Awesome. Scott is back and we're plotting out what the next year will look like. Not awesome. Sometimes it's really hard to make decisions. This helps. Good to know about the Old Navy bag. Sometimes they can look great - or REALLLLLY cheap. Mango Black Tea Lemonade - my go to drink all year long. Ohh we're plotting out the next few years right now too! It's hard. We made a list last night of what was important to us and ranked it and then a list of places and ranked those. We have tons of options(too many options?) and without kids, it always feels like, well we can do whatever whenever and it just seems like any decision we make is a decision we can change 5 minutes later, you know? But still. We started talking about the next few years a few months ago and I'm pretty sure we've only added options and haven't narrowed it down at all! 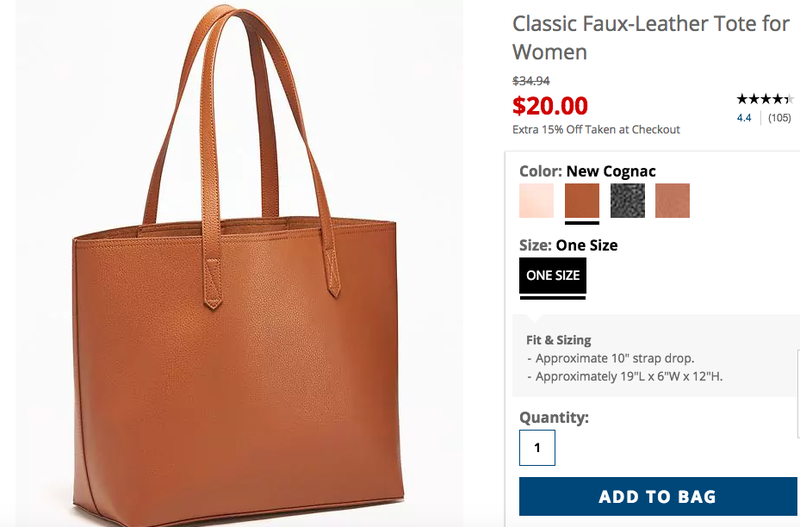 I had an awesome metallic old navy tote that they stopped selling but it looks to be the same bag, just not in metallic. I'm glad Scott is back! What are your options for the year? Shoe tan lines make me happy. I cannot for the life of me explain why. I love inexpensive things that are also good quality. That's hard to find these days! Glad Scott is finally back! I'll have to try that mango tea lemonade next time I'm in civilization. I always liked their passion tea lemonade. My sandals gave me a wicked tan line and it's pretty funny. You see that is great to share the things like you do and your experience is precious.